Considerations around text alignment, leading and kerning, as well as line length and the use of caps, are applied to all exhibit text to ensure readability (see Figure 5.4.1). Text is aligned to the left. We avoid text that is centred, justified or aligned to the right. Text that is left-aligned with a ragged right margin is easier to read for visitors with low vision and/or cognitive disabilities. Justified text results in uneven spaces between characters, which must be kerned to ensure readability (see “Kerning” below). Leading – the distance from the bottom of one line of type to the bottom of the next – is set to at least 20% greater than the point size of the font that is used. Consistent spaces are used between letters and words in all exhibit text to ensure characters do not touch each other and to ensure the text is readable. 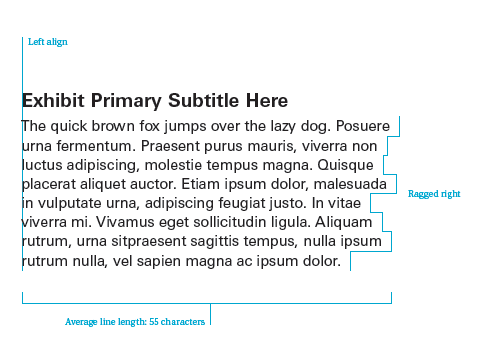 Exhibit text uses a maximum of 55 characters per line of text to avoid reader fatigue and to enhance readability. Exhibit text is set in uppercase and lowercase to create a distinctive word shape to ensure readability. All caps are not used as they are more difficult to read; the result of all caps is a featureless shape that makes words harder to recognize and decipher for visitors with low vision and/or cognitive disabilities (see Figure 5.4.2).